We could barely contain our excitement as we counted down the remaining miles. Each mile felt longer than the last until we finally rounded the corner and saw the sign. The border between California and Oregon on the trail was marked by a simple inscription that had been carved into a small wooden sign and nailed to a nearby tree. Aside from a trail register containing a notebook full of names and dates inside, there was little to denote a place of monumental importance to all of the thru-hikers that pass here. We spent a good thirty minutes celebrating and drinking lukewarm beer that we had carried for days from the last town stop. It tasted amazing. The border represented more than simply a change of state. It marked a mental shift in our determination to complete the trail. When we set out on this adventure many months ago, we had always intended to finish the entire trail, but here, for the first time, the end goal finally felt within reach. Yes, we still had a long way to go, there was no mistaking that, but after walking across the largest state and completing more than half of the trail, the impossible seemed possible. As we approached the second of just six stops across the state of Oregon, I couldn't help but notice the cold setting in. It was mid-afternoon, yet my hands felt stiff and frozen against the handholds of my trekking poles. Over the last few days, the weather had shifted dramatically from summer-like temperatures to the cold typically more indicative of late fall. Crater Lake was going to be an important resupply for us. We had begun to realize that some of the clothing that had served us so well over the last few months needed to be replaced with warmer and more weather resistant articles. This was going to be challenging, as Mazama campground was in the middle of Crater Lake National Park, which had no access to shops. Thankfully, we had been told that there was mobile signal available, so we would likely be able to order items from Amazon and have them delivered to a town further up the trail. By the time we arrived the weather was bitterly cold. Needless to say, we were overjoyed to see a large restaurant in a rustic log building that just happened to be complete with a roaring fireplace. Brilliant. We jumped at the opportunity for a hot meal and some real warmth. When we entered, I think the hostess took pity on us, seeing how cold we probably looked. She seated us right next to the fire and we spent the next hour or so blissfully eating an excellent and unexpected meal. By the time we left the building, the sun had long since set and the first few snowflakes had begun to fall gently from the dark sky. Thankfully, we had set up our tent earlier in a group campsite with many thru-hikers. We had also been sure to pick up a few beers and some wine, now starting to freeze in the tent vestibule. When we arrived at the campsite, our friends had already started a campfire in the center of the surrounding tents. We all enjoyed the time spent around it, but there was an unmistakable sense of foreboding as we felt the chill of winter closing in. The next morning, we awoke to a blanket of snow that had fallen in the early hours of the morning. That day was spent planning and preparing for the rest of the trip. 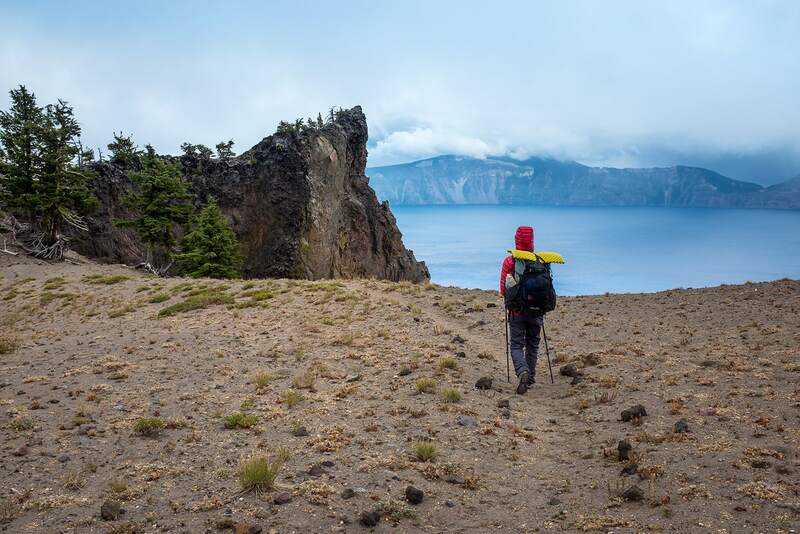 Like many other hikers, we had elected to take an alternate route leaving the PCT that directly skirted the cliffs over the pristine waters of Crater Lake. Sam and I split off to tackle the many tasks at hand, ensuring everything would be ready for our departure the next morning. The weather the following day had greatly improved and much of the snow that had fallen earlier had started to melt. Early in the morning, we climbed into a shuttle bus provided by the park with service to the crater. Many had stayed back an extra day due to the poor weather conditions from the day before. We were all itching to get back on the trail. We joked and sang loudly as the bus pulled up in front of the final stop. Formed by a volcanic eruption some 7700 years ago, Crater Lake was created by rain and snow being deposited into the basin where Mt. 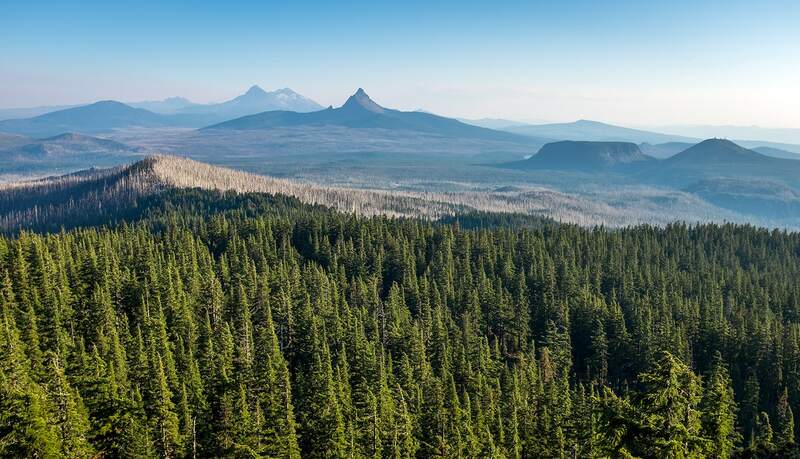 Mazama once stood. Standing on the rim of the enormous crater, it would be impossible not to be in awe of America's deepest lake. The color of the water is an incredibly vibrant azure tone and is surrounded by steeply sloped walls. 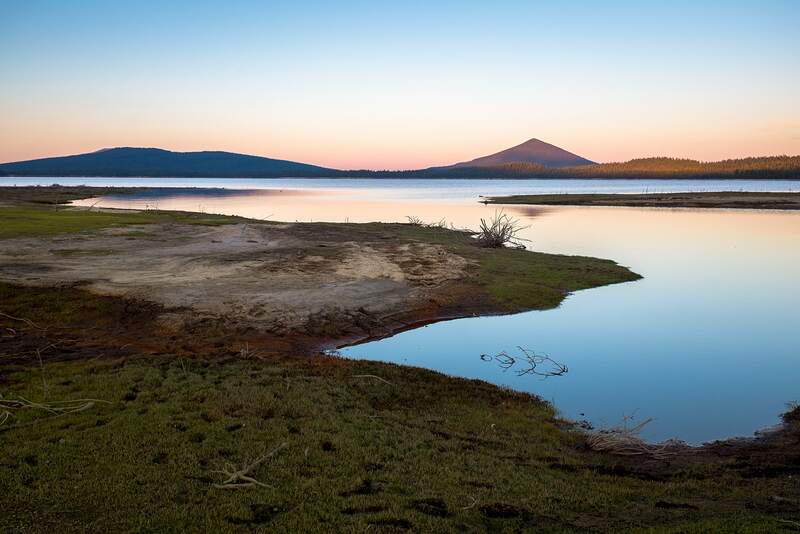 At the western end of the caldera, Wizard Island rises out of the blue waters, formed from a volcanic cinder cone. It was truly one of the most spectacular sights we had come across along the trail. That day we hiked around the enchanting and lonely landscapes, experiencing what felt like all four seasons in one day. We began the day bathed in warm sunshine and ended the day with heavy snowfall. I will remember this portion of the trail vividly for years to come. Thankfully the weather improved significantly over the next few days, with temperatures rising to seasonal norms. 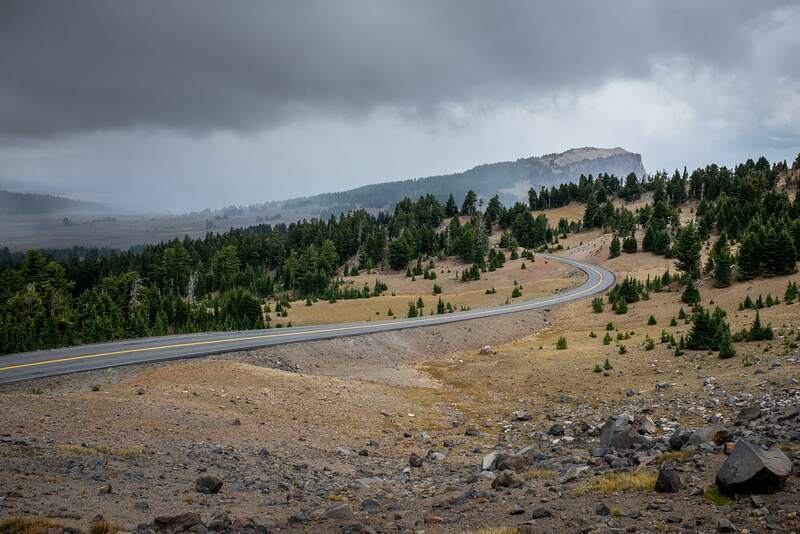 We only experienced bad weather once more before crossing the border into Washington and that was when we arrived at the historic Timberline Lodge, on the south face of Mt Hood. It had been a rough day. That morning I had awoken in my sleeping bag with a full-blown ear infection. The cold I had picked up earlier had migrated from my sinuses into my right ear the night before. As we had begun the slow climb towards Mt. Hood, the pressure change became excruciating, eventually causing the eardrum to rupture. We had to divert from the trail to seek medical treatment in a nearby town. As you might imagine, we were overjoyed to finally arrive at the hotel that night. A large group of hikers had been racing towards the hotel for the last three days for two distinct reasons: the first was the legendary all-you-can-eat breakfast buffet, a meal that we had been hearing about for over 500 miles from thru-hikers traveling southbound, and the second (and perhaps more pressing reason) was the massive storm system that had been heading our way for the last week. We had been warned that the inclement weather would bring with it massive amounts of rain, ice and snow, and would likely last for days. The first few drops began to fall just as we climbed the stone steps and walked through the front door. Inside, the grand hall was designed in a rustic cascadian architectural style, with massive wooden beams and stone sourced from the surrounding land during the Great Depression. A building steeped in fascinating history, it is certainly the most impressive man-made structure along the Pacific Crest Trail. Today, the building is run as a desirable high-end resort, with very wealthy customers spending hundreds a night for the privilege of sleeping in one of the historic rooms. Needless to say, we felt very out of place after five days without a shower, covered in sweat and dirt. We certainly couldn't afford a room, but we needed to find a way to shower and clean up. We looked around until we eventually came across the showers. Although Sam tried to sneak into the women's without anyone noticing, I could hear her talking to someone. As I imagined the wealthy visitors in the lodge would be put off by our appearance, I expected Sam to come back out at any moment. I was surprised when she didn't. 15 minutes later, she rushes out to greet me, freshly showered, and with a huge grin on her face. "I ran into someone!" Sam said. "I fully expected to be booted, but the woman was completely plastered! She couldn't have cared less that I wanted a shower and asked me about trail... Find the men's shower! You should be good to go. I'll watch our stuff. Come back out and meet me afterwards." After showering I met back up with Sam who had already run into another hiker with a room. "Paul! I just met a hiker down the hall. He's super sweet and said they give out laundry tokens to guests at the front desk. Apparently all they ask for is your room number and your last name, so he gave me his info and said we could use it for tokens." Although it was very kind of the other hiker, I was doubtful that we could convince staff at the front desk we were actually staying there. Sam on the other hand, was convinced she could make it happen. "I just showered!" she said. "I'll wear my thermal leggings and a half-decent looking town shirt. Oh! and I can wrap one of the fresh towels from the showers around my shoulders. I'll look as if I've just come back from the gym or a yoga class.... they must have those here, no?" She grinned. Sam rushed off to the front desk and came back beaming. Before she even said it, I knew she had managed to get tokens. After running our filthy clothes through the washer and dryer, we got dressed and headed for the large and very inviting bar. On our way there, we met the rest of the gang, most of them already a few rounds in. Surprised by how clean we looked, we told them where to access the showers by the pool. By this time, it was pitch black outside and absolutely pouring with rain. None of us fancied the prospect of going back outside to find a campsite, and the group had already pooled some cash together to buy a room. We realized that if we could cram about a dozen hikers in a single room, we could quickly reduce the cost to stay down to a very reasonable $20 per person. Without a second thought, we were in. As one can imagine, space on the floor was at a premium that night, but at least everyone stayed warm and dry. The next morning, we awoke just in time to catch the breakfast buffet. We loaded up on bacon, eggs, waffles, fruit, and almost anything else you could imagine before returning to the bar to spend much of the day relaxing (drinking). The storm outside had not subsided and in fact seemed to be getting worse. No one had any desire to leave the warmth of the roaring fire in the Great Room. I glanced out of one of the windows into the driving rain outside and felt sorry for any hikers still out there. During the day, some of the other hikers had been sharing stories with a very wealthy couple who were fascinated by the PCT. That night, they quietly paid for another room for us all to share, for which we were all incredibly thankful. Later that night, everyone ended up downstairs in the onsite movie theater watching a screening of 'The Shining.' We had learned from staff that this was the hotel they had used throughout many of the pickup shots in the film. As Sam and I squeezed together, eating popcorn and basking in the glow of the movie screen, I felt so incredibly lucky to have shared this adventure alongside the love of my life. 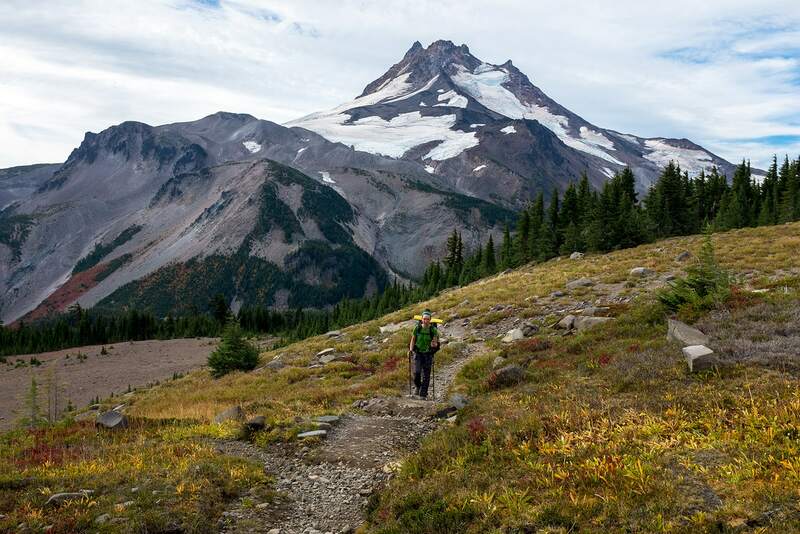 Oregon was a blur of so many amazing experiences, but some of the most memorable occurred towards the end of the state. We decided to take the 'Eagle Creek' alternate, a trail that could only be described as magical. Waterfalls cascaded into a deep and narrow gorge covered with emerald moss. 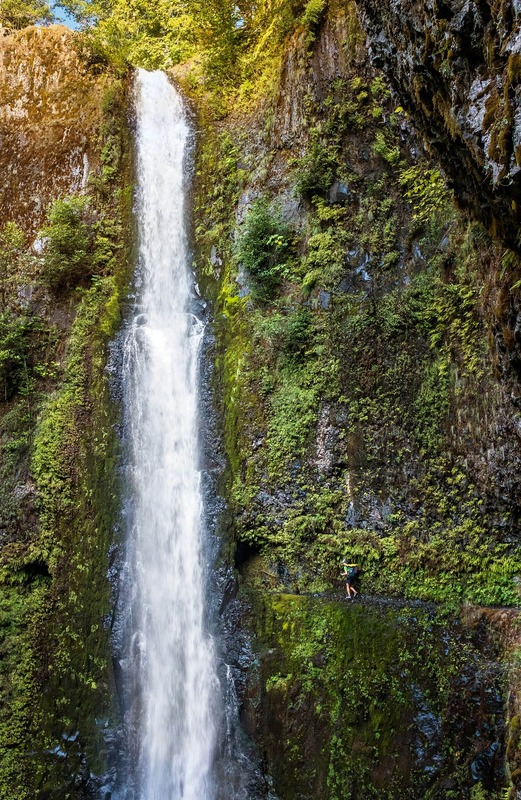 In many places, the trail had been cut into the steep cliffs of the gorge, even traveling behind one of the larger waterfalls. It was the last stretch of trail before arriving in the town of Cascade Locks. Cascade Locks is famous for the 'Bridge of the Gods', a steel truss cantilever bridge that crosses the vast Columbia River into the state of Washington. Cascade Locks was a place of reunion for us. We reconnected with so many friends, some of whom we hadn't seen for hundreds of miles. We spent much of the time outside in the sun, drinking beers and eating ice cream together. With just a single state left, we were all beginning to realize that our adventure on the PCT would be coming to an end all too soon. We knew it wouldn't be easy to part ways after forming such strong bonds over the last six months. We managed to arrange to meet Mark and Jeff, two section hikers that we become great friends with while in the desert. 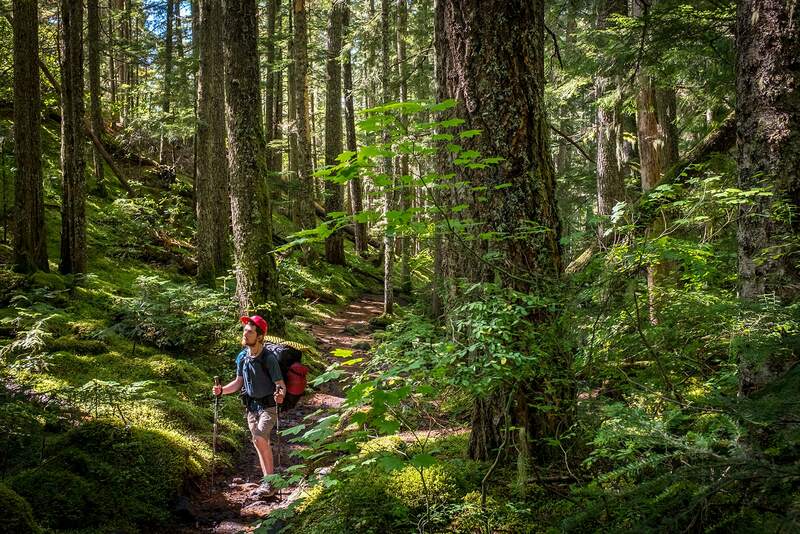 Each year they hike a small section of the PCT with the ultimate goal of completing the entire trail. After they had returned to Portland, Oregon, we remained in touch. It was amazing to sit across from them after so many months and to share experiences and advice for the upcoming sections they were planning for. Later we rejoined a large group of hikers who had managed to locate a bar offering happy hour special at $3.50 per beer. We knew where we'd be for the remainder of the evening. I still have vivid memories leaving the bar late that night and seeing our friend 'Mac' slumped against the wall with one sock on and one sock off. The Seahawks had lost again. 'Cheese' (his girlfriend), would have some comforting to do! The following day was spent much like the first. We were walking along the main road when we saw a Honda Civic swerve and screech to a halt. Out jumped Mark, another hiker who had dropped off trail a couple of hundred miles back. We couldn't believe our luck. He told us that he had spent the last month or so traveling along the west coast and was only now beginning the long drive back home to Ohio. What a small world! At sunset, we finally crossed the steel truss bridge which soared high above the Columbia River. Hooting and hollering, we looked down through the grating to the dappled water far below and took our first steps into Washington State.